February | 2016 | What Next? 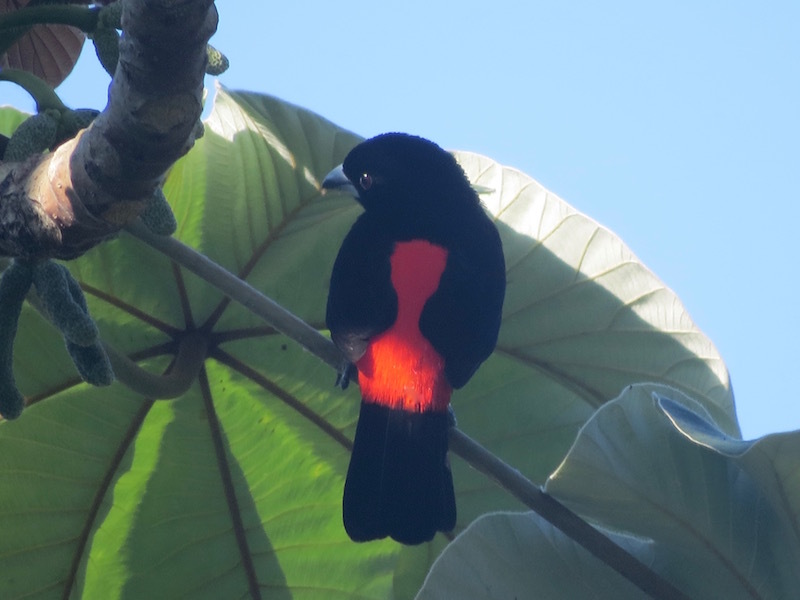 Dave has been somewhat obsessed with taking photos of birds here in Costa Rica. But he didn’t know the names of all those beautiful birds he was photographing. 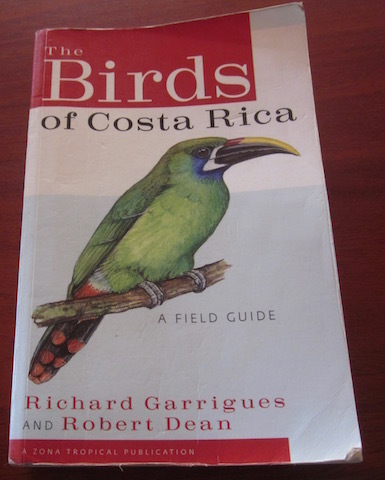 Our hosts here in Monteverde Rise and Dario have a book of Costa Rican birds compiled and illustrated by friends of theirs. It has been invaluable in helping Dave identify the birds he’s captured on film. Here are some of them. And yes Dave took all of these photos. This morning we are going on two canopy tours one on a sky tram and on a series of suspension bridges. Who knows how many more birds Dave will be able to photograph? We are now in Monteverde Costa Rica staying in the spacious Fig House in the foreground of this photo. Our hosts Risë and Dario and their two sons live in the blue house just behind us. Risë is a teacher in a local school and Dario is a graphic designer. Risë is orginally from Baltimore, Maryland and Dario from Bogota, Columbia but they met right here in Monteverde in 2003. Fig House was built by Risë’s mother and she lives there half the year. When she is back in the United States Risë and Dario rent her house out to guests. The house is almost brand new and absolutely gorgeous. You can see lots of photos of the finely crafted interior here. On its website the house is shown with a beautiful rainbow and we wondered if we would see one too. Sure enough our first morning here there was a rainbow in the sky that lasted for a long time. As the sun rose higher and higher the rainbow sank lower and lower till it disappeared. It was lovely to watch from the comfy hammock chairs on our front porch. We did a 7 km. hike to a beautiful waterfall when we were in San Gerarado de Dota. The scenery along the way was absolutely wonderful. We passed by this monument dedicated to the Costa Rican pioneers who first came to this isolated valley in 1954 to establish homes and farms. They were coffee plantation workers who dreamed of having a place of their own. The hiking trail to the waterfall actually begins at a trout farm. There are several trout farms in the San Gerardo valley. I throughly enjoyed the first part of the hike. It wasn’t easy by any means. Lots of steep trails, big tree roots, rocks to rappel up with ropes and caves to move through. My brother who likes to make videos as he travels by interviewing his companions had me share my feelings on film. If you click the photo below you can hear what I said about enjoying this hike. shortly after I gave that interview I changed my mind about the hike not being scary, when we came to this swinging suspension bridge. There were no closed sides to it. Some of the slats on the bridge were broken. You hung onto this rope that was torn in some places. I WAS VERY SCARED!! What if I slipped and fell into the river or onto the rocks below? My husband Dave took this close up of my face and you can see how hard I am focusing and concentrating on getting across that bridge without falling. And once I was across I had to handle the terrifying knowledge that I needed to travel back across it on the way home. We sat at the waterfall for quite a long time which helped me gather my courage for the trip back. There were all these gorgeous butterflies at the waterfall and Dave took photos of several different kinds. 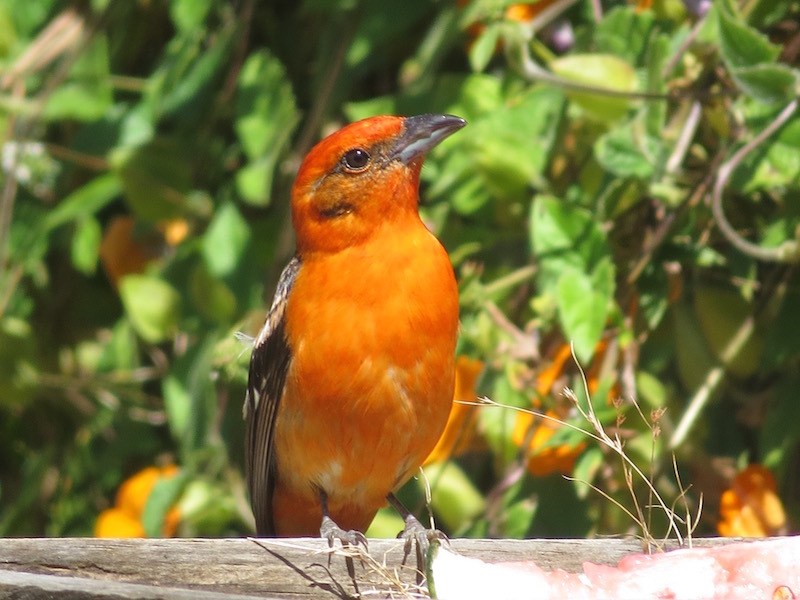 We met a Dutch couple who were birdwatchers. They taught us the call of the resplendent quetzal and as you read in my blog post yesterday we spotted a quetzal on our hike back. I walked the bridge very slowly on the return trip but I was proud of myself for conquering my fear. I did change my mind about the hike. It was too scary! But I’m still very glad I did it! We found a quetzal in the wild! Can you believe it? 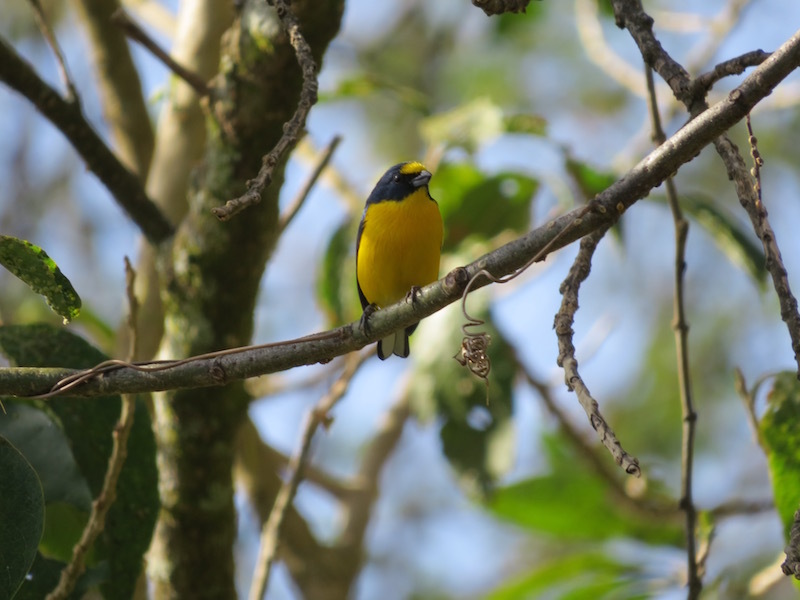 We were on the return journey of a hike to a waterfall here in San Gerardo de Dota, Costa Rica when Dave spotted a brilliantly colored male quetzal in the trees. For nearly fifteen minutes we had him all to ourselves and Dave clicked photo after photo. There are only 80 quetzal couples left in the cloud forest here and spotting them isn’t guaranteed. Visitors from all over the world come to San Gerardo to observe them in the wild and many leave disappointed without ever seeing one. As we sat enjoying the waterfall at the end of the first leg of our hike, we chatted with a couple from Holland who taught Dave to imitate the call of the quetzal and as we hiked back home Dave kept whistling it. And then……… all of a sudden a quetzal flew into a tree in a little clearing. It was a magic moment. Quetzals mostly eat the fruit of the wild avocado tree and farmers in San Gerardo are planting more and more of these trees to attract quetzals to this valley and keep them here. There is also a law that no trees in the valley can be cut down. Any new buildings must be erected on land that has already been cleared. There is a real effort to preserve this quetzal habitat. And no wonder. 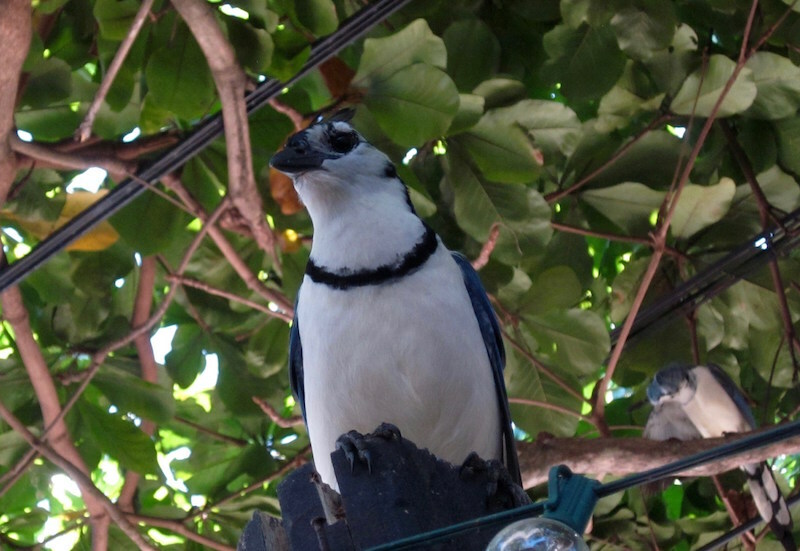 These birds considered sacred by the ancient Mayans and Aztecs bring thousands and thousands of tourists here each year. The males are much more brilliantly colored than the females and during the mating season, which has just begun now in February, they grow these long twin tails that can be up to a meter long to attract females. Males need to be three years old before they can grow a tail. Once they’ve mated a pair of quetzals use their beaks to enlarge holes in trees made by other birds and animals to make a nest for their two or three blue eggs. Both parents take turns incubating the eggs and bringing food to the babies once they hatch, but many mothers abandon their babies near the end of the nesting period and the father is left alone to care for the fledglings. After about three weeks the babies are ready to fly on their own. After finding this quetzal Dave kept doing his quetzal calls and sure enough a little further down the trail both a male and female appeared in the trees. Unfortunately they didn’t stay long enough to photograph. 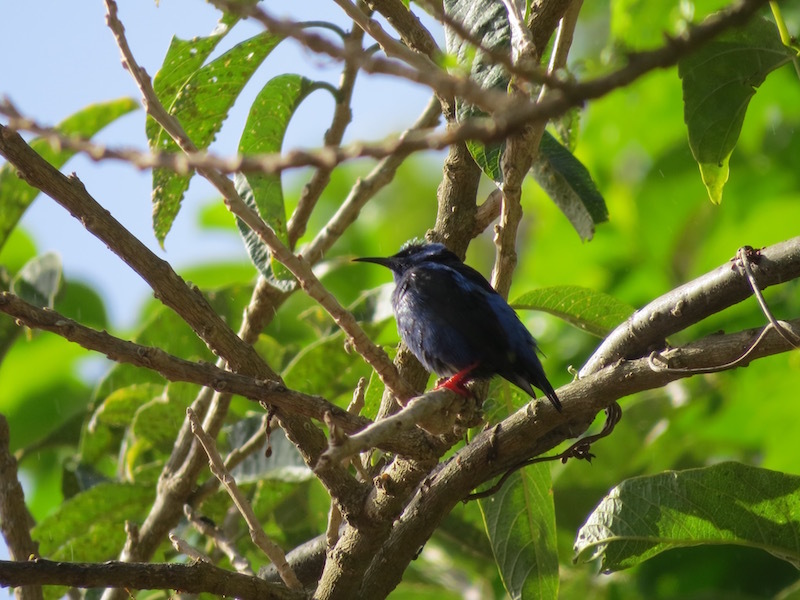 But we’d seen three quetzals on just one hike! We’ve given Dave the nickname ‘quetzal whisperer.’ I think he’s pretty proud of it! My husband Dave took all the photos in this post. We drove 48 miles and what a difference. One morning we were in Dominical Costa Rica in sweltering heat and by the afternoon we were in San Gerardo de Dota where the owners of the lodge where we are staying lit a fire before supper to warm us up. The difference? In San Gerardo we are at an elevation of 7000 feet and in Dominical on the beach our elevation was 25ft. 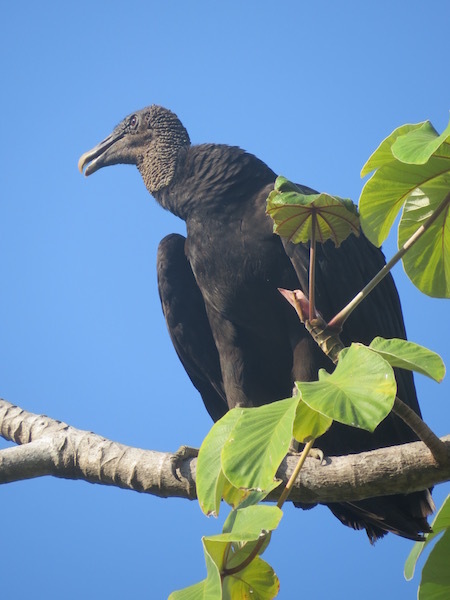 Up till now in Costa Rica we’ve slept with the sound of the ocean surf or howler monkeys lulling us to sleep. Here in San Gerardo we hear the running of the Savegre River and in the morning the crowing of the roosters on the farms around us. San Gerardo de Dota isn’t really a town it is just a string of lodges each a short distance from each other in a deep valley surrounded by the towering Talamanca mountains. The landscape is very different from what we have experienced in Costa Rica so far. The San Gerardo area is called a cloud forest area because of the persistent cloud cover particularly at the canopy level. 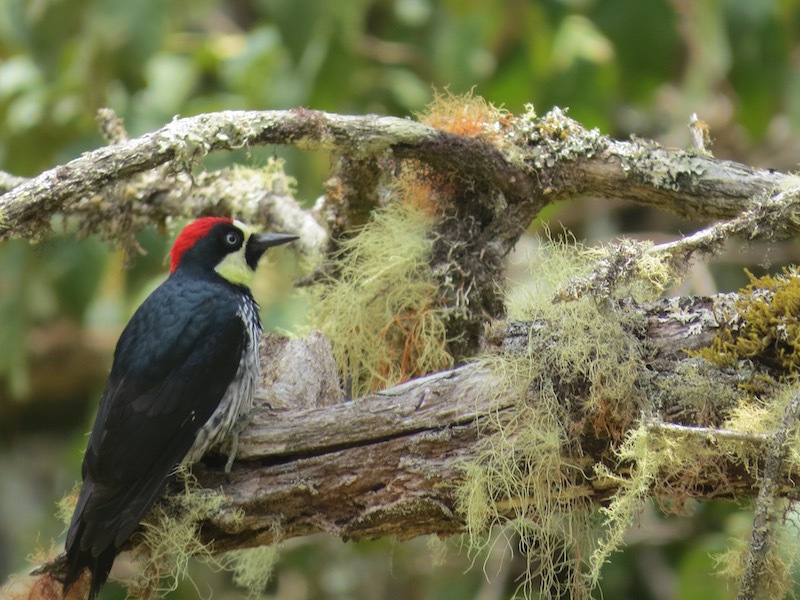 Because of their dampness cloud forests maintain an amazing biodiversity of plant and animal life. 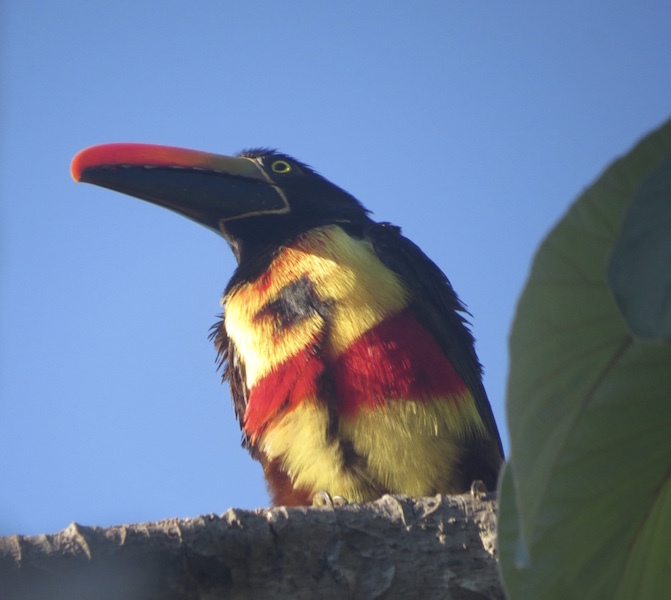 San Gerardo is known for its birds. We are staying at the El Manantial Mountain Lodge. A rustic beautiful place with simple delicious meals and friendly staff. Our lodge is fairly isolated and nestled in the valley. There is a lovely sunny patio perfect for our late afternoon card games and for Dave to sit as often as he can to try to catch just the right shot of the many hummingbirds that haunt the porch. He’s got some great photos. I promised my husband Dave I’d make sure everyone knew he was the one who noticed the hawksbill turtle we spent such a long time watching on our snorkeling trip in Uvita, Costa Rica. Now that you all know Dave was the turtle spotter I’ll tell you more about our trip. Our snorkelling boat hadn’t been out long when our driver saw a plastic bottle in the water. He stopped to retrieve it and realized it was attached to a very long fishing line covered with hooks. Our guide and boat driver took turns pulling it aboard. They told us it is illegal to fish within 13 kilometers of the shore. There are many endangered species of fish and turtles in that designated conservation area but fishermen still try and get away with catching them. Everyone needs to help stop this kind of illegal fishing. We saw lots of pelicans and several pods of dolphins as we rode to the snorkeling area. Some dolphins jumped high in the air. Others followed along with our boat. The thing I loved most about them was the way they made three year old Mateo laugh. He was a little boy on board our boat with his parents from San Jose, Costa Rica. Our guide told us there used to be hundreds of hump back whales that came to this conservation area to give birth to their babies, but the ocean water here has become too warm, so now they go elsewhere. We went snorkeling near the rocks of The Whale’s Tail. The Whale’s Tail is a long sand spit with two rock arms that appear to form the fins of a whale’s tail. The Whale’s Tail is only visible at low tide. The water around the rocks that form the Whale’s Tail is home to lots of colorful fish. Our guide got into the water with us to show us where to look for them. We were having a great time spotting fish when my husband Dave started motioning to us under the water and pointed to a hawksbill turtle hard at work trying to get some food from between two rocks. He looked like he’d pull something out from between the rocks and put it in his flipper and then put it in his mouth. Then he’d go diving back down head first for more. Sometimes he stood on his head in the water as he worked and sometimes he flipped right over. We watched him for a long, long time. It was better than any movie. Later our guide told us the hawksbill is gravely endangered because for years it has been hunted for its shell which is used to make jewelry, tortoise shell combs and other items. People also eat the hawksbill’s eggs. Hawksbill turtles are protected by international law and are illegal to hunt. We also found out the hawksbill has a sharp hook on its nose and can be aggressive. After the snorkeling trip we walked along the sand spit that forms the Whale’s Tail. It was a good snorkeling trip but the best thing was seeing that turtle in the sea and it was all thanks to my husband Dave. In Uvita we did a hike to a wonderful waterfall. When we first arrived we were the only ones there So we quickly shed our clothes and got into the water. It wasn’t long before a large Costa Rican family joined us. The father was very insistent that his teenage daughter have a conversation with Dave to practice her English. She asked good questions. Here Dave is describing the cold and snow of Winnipeg to her. After swimming for quite a long time we hiked up the river bed to a smaller waterfall and pool. Dave contemplated whether or not he should jump from the high rocks at the side There he goes! Good landing! Where the water rushed over the rocks there was a little cradle in the stones where you could lie down, put your ears under the water and the spray whirled around you like you were in a hot tub at a spa. All the outside noise was blocked out except for the sound of the water. It was blissful! Floating in that lovely cool pool in the Costa Rican heat and staring up at the sky and clouds through the trees was sooooooooo relaxing. It was hard to leave and begin the rocky trek home.